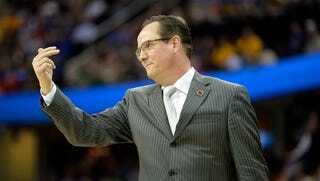 Wichita State men’s basketball coach Gregg Marshall was a hot name after the Shockers handled second-seeded Kansas to make it into the Sweet Sixteen this year. But with a little help from a thing called “a lot of money,” Charles Koch and the rest of the school’s boosters were able to keep their in-demand coach. Charles—who, along with his brother David, comprise the politically influential and obscenely rich duo in charge of Koch Industries—has financially backed Wichita State for years (the Shockers have played in Charles Koch Arena since 2003). Last December, the Kochs gifted $11.25 million to the school, with $4.5 million going to athletics. He and Marshall reportedly have a yearly meeting to discuss the “state of the program.” (To be clear, Koch is not Wichita State’s athletic director or university president.) So, of course, he played a hand in convincing Marshall not to take an enticing interview at Alabama. Marshall’s base salary stood at $1.85 million a year; Koch organized a group of boosters and raised that to about $3 million, according to the Wichita Eagle. The Shockers keep the best coach they’ve ever had, and he gets a top-10 salary. Everyone’s happy. Most importantly, Charles Koch is happy. The Shockers are still considered a mid-major: they play in the Missouri Valley Conference, and their total athletics expenses of approximately $21 million pales in comparison to any school in any of the power conferences. For comparison, the athletics expenses of Northwestern, the smallest school in the Big Ten, are about $68 million. Wichita State works with a smaller budget. But whenever help’s needed, the world’s sixth-richest man can provide some support.